Aboriginal Art & Culture: an American eye | Indigenous Australian art, culture, anthropology, music, politics, literature…. On December 2, Will Owen unexpectedly passed away in his sleep. Having thoroughly enjoyed Vivien Johnson’s previous book, Once Upon a Time in Papunya, her attempt to chronicle the rise of Papunya Tula Artists, I didn’t really think twice when Rosina Di Marzo of New South Books reached out to ask if I would be interested in reviewing Johnson’s newest publication, Streets of Papunya: the re-invention of Papunya painting. A few weeks late the handsome volume appeared in my mailbox, and I settled in to read. Johnson’s allegiance to the town of Papunya itself has not wavered over four decades since she and her husband at the time, the artist Tim Johnson, trekked out to the settlement to investigate the new art movement that was taking shape there. And although the town donated its name to the longest-lived and most prosperous Aboriginal art company to date, the force of the movement went west, “Kintorelakatu,” as the Warumpi Band sang it, in the great exodus of the Pintupi to their homelands, first at Kintore, or Walungurru, and later even farther west at Kiwirrkura, where the movement and the company continue to flourish to this day. In recent years, with the flourishing of the desert art movement again in the central and southern reaches, Papunya’s name has come into common parlance in a new way, associated now with Papunya Tjupi, a new company that remains firmly rooted in the Honey Ant, or Tjupi, Dreaming. In her new book, Johnson sets out to chronicle art in the town of Papunya from the early day soy the 1950s up to the present, and in doing so she has woven a story that fills in many blanks and provides much-needed continuity. She has also, for me, told a tale that evoked many partly forgotten memories of my own earliest explorations of the art of the desert. The literal streets of Papunya have long held a fascination for me, ever since I first saw an aerial view of the town that displayed an uncanny resemblance to a traditional sand drawing of four people seated around a campsite. It took a while to track down the origin of this striking design as documented in the Rev. J. H. Downing’s Aboriginal ‘Dreamings’ and Town Plans: a report on traditional Aboriginal camp layout in relation to town planning (Institute for Aboriginal Development, 1979). The conscious decision to pattern the settlement’s growth on the honey-ant designs has found new expression in recent times. The legacy of the founders of the Papunya art movement (as distinct, in some cases, from the founders of Papunya Tula) now lives on in the streets of Papunya, which bear names like Warungkula Court and Possum Crescent. In a new access of pride in their history, the residents of Papunya, many of whom are direct descendants of the old men who initiated the painting movement and became it earliest household names, have rememorialized the families that are the backbone of tradition in the community. 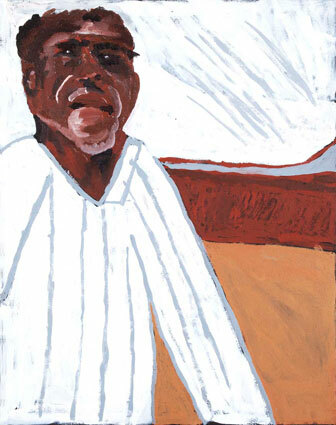 Johnson’s history begins in the 1950s, an early chapter being the story of Albert Namatjira’s six months of court-ordered house arrest after his conviction for supplying alcohol to a “ward of the state.” The presence of the most famous Aboriginal artist of all time in the town seems to have ignited a keener interest in the production of art, although the majority of the earliest attempts were either watercolors in the style of the master, or wood carvings that, despite their complexity and beauty, could easily be hawked to the tourist trade. By the time of Geoffrey Bardon’s storied arrival, then, several of the names that now adorn the streets of Papunya were already in circulation as artists, names that became the first rank of superstars: Kaapa Mbitjana, Johnny Warungkula, Clifford Possum, Michael Nelson Jagamara. These men, along with others like Long Jack Phillipus, Limpi Putungka Tjanpangati, Don Tjungurrayi, and Two Bob Tjungurrayi, were to become the Papunya artists: they painted early on for Papunya Tula, but they also remained behind when the Pintupi left to invent new pictorial traditions and sustain the Dreamings of Papunya. The story of Papunya painting in the 80s and 90s as Johnson tells it is for me the emotional center of Streets of Papunya, although I must say up front that that is a most personal judgment, reflective of my own history far more than Johnson’s. The first Papunya painting that I owned was a brilliant Water Dreaming by Long Jack Phillipus. 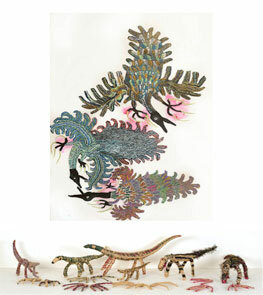 The most startling early Papunya board I’ve ever fallen in love with is a Crow and Yam Dreaming by Limpi (at right), an artist I had never heard of until I saw the work reproduced in an auction catalog. 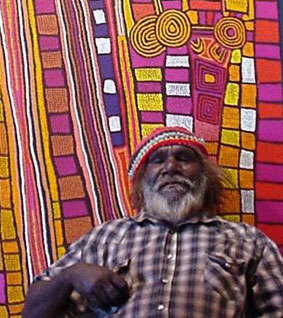 For some reason I could never recapture, I was fascinated by the work of Two Bob Tjungurrayi; now having read Johnson’s book I understand that the brilliance of Turkey Tolson’s Straightening Spears paintings owes a great deal to stylistic innovations that Limpi and Two Bob undertook in the late 80s, before Turkey and his fellow innovator, Mick Namarari, themselves left the streets of Papunya behind. Reading about the heyday of Warumpi Arts, then located on Gregory Terrace around the corner from the old Papunya Tula shop, made me remember how thrilling it was in those days to be discovering the genius of the art of the central desert. 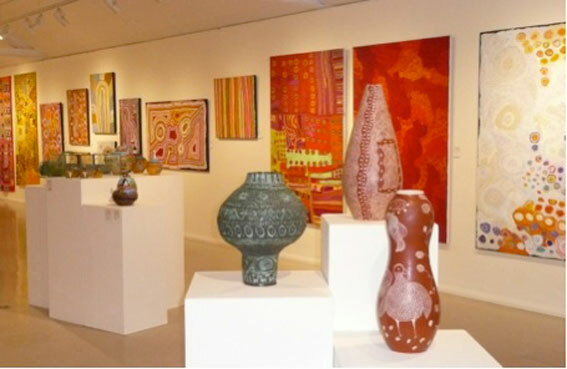 Many of the artists who catapulted Papunya Tula to fame remained in Papunya after the Pintupi exodus, and considerable artistic innovation was happening there. Limpi Putungka and Two Bob Tjnugurrayi introduced a tile of dotting backgrounds in stripes of alternating and contrasting colors, adumbrating the Straightening Spears motif that would make Turkey Tolson internationally renowned. Turkey and Mick Namarari themselves stayed close to Papunya for years after the settlement of Kintore. 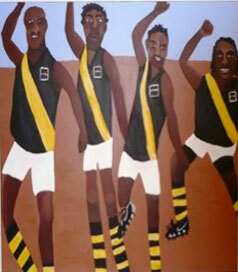 Warumpi Arts was providing a successful commercial outlet in Alice Springs for the likes of Long Jack Phillipus, Dinny Nolan, and Dini Campbell. 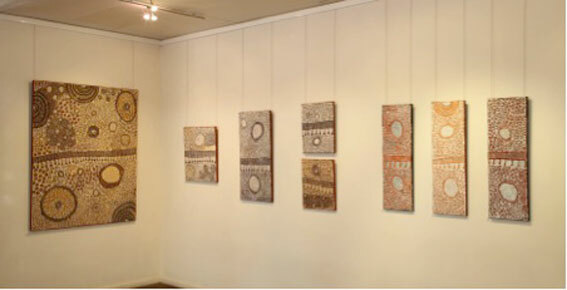 But art making in Papunya remained a precarious business without the support of a local art centre. As many of the old men died or grew too frail to paint extensively without support (Johnny Warungkula was nearly blind), wives and daughters became more central to the continuing painting tradition in the tiny settlement town. Appeals for government support stalled in Canberra’s bureaucracy or went unheard at all. But the artists (and Johnson) persisted in their efforts to pass on the stories in the new format of acrylic paint. Finally in the mid-noughts, the developing talents of the women painters and the persistence of friends and supporters began to bear fruit. A disused mechanic’s garage and an empty schoolteacher’s apartment were turned over to the use of a fledgling art centre and its coordinators. But even then, obstacles remained: for example, although the garage was fitted up with utilities and plumbing that allowed work to take place there and be stored safely, it proved impractical to subdivide the building in order to provide culturally appropriate separate spaces for men and women to work in. 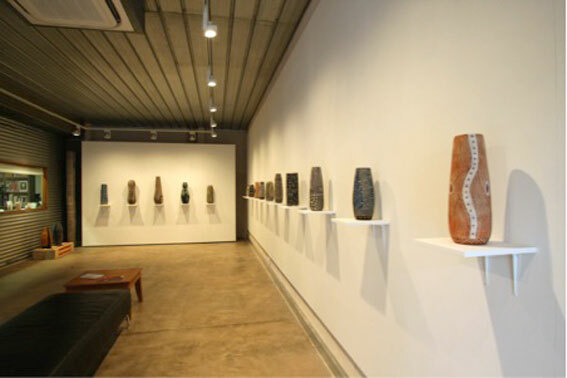 This simple fact helps to explain why even today the output of Papunya Tjupi, as the new centre came to be known, features primarily the work of women artists: the men have had a hard time finding the proper support to develop their talents. 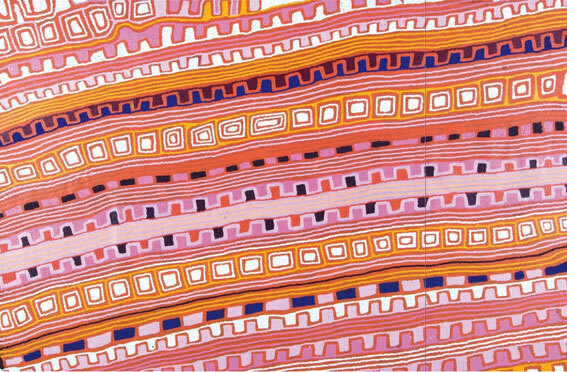 The women, however, have become a force to be reckoned with in the 21st century wave of desert painting, developing a style that recognizably belongs to Papunya Tjupi, but at the same time constantly developing new idioms and experimenting with new compositional strategies. Doris Bush Nungurrayi, Candy Nelson Nakamarrra, Isobel Gorey Nambajimba, Narlie Nelson Nakamarra, and Martha McDonald Nampitjinpa are among the artists who feature regularly in survey shows of desert painting, and even some of the old-timers, like Emily Andy Napaltjarri, who painted for Warumpi Arts in the 90s, have been re-invigorated in their practice. Johnson’s new book documents this living tradition with warmth, affection, and fervor. Beautifully illustrated with artworks that capture the history of painting at Papunya for nearly sixty years and with affecting family portraits (and in an appendix, extensive family trees), it captures this vital but long overlooked chapter in the history of desert art. It cannot fault to generate even more enthusiasm for the constantly evolving sensibilities that have sustained Papunya through all its trials. It is a lovely, and loving, testament. 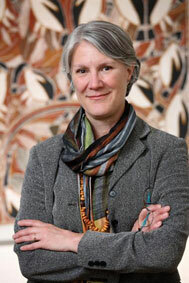 Dr. Margo Smith, Director of the Kluge-Ruhe Aboriginal Art Collection at the University of Virginia has been awarded the Order of Australia for her work promoting Aboriginal art and culture in the United States of America. The first thing to recognize is that very few people who are not Australian citizens have been awarded the AM. Even fewer if you weed out peers and cricketeers. 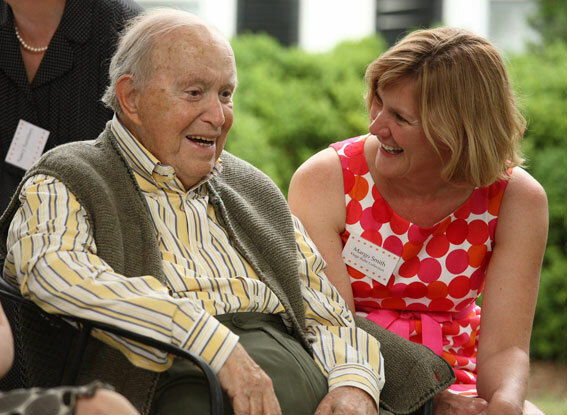 Other Americans with whom Margo shares the honor include Admiral Mike Mullen, the former Chairman of the Joint Chiefs of Staff, and internationally beloved comedian Jerry Lewis. Pretty elite company, wouldn’t you say? But considerations of citizenship aside, Margo richly deserves this honor. 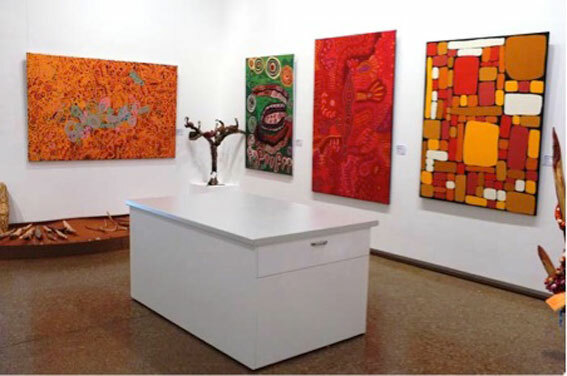 The Kluge-Ruhe not only contains one of the largest collections of Indigenous Australian art outside of Australia, it is the only museum totally dedicated to that art in the Americas. From its origins in the late 1990s as an outpost on the fringes of the University and south of the US capital of Washington, DC, the Kluge-Ruhe has became an international destination for enthusiasts, collectors, curators, and artists. It is true, as Rover Thomas taught us, that “roads cross” and Margo has made her humble quarters on Pantops Mountain, amidst the splendor of Virginia’s hills, a crossroads both physical and cultural. One of the chief reasons for this success is Margo’s genuine Southern hospitality, something we prize greatly in this part of the country, and something I learned about her early on. We made our first trip to Charolottesville to visit the Collection in 2001, just a few years after in opened to the public, drawn by the promise of being able to consult the many printed volumes and research notes housed in the museum’s study center. At the time I had a pretty insignificant collection of books about Aboriginal art of my own and just enough knowledge to understand how big the gaps in my education were. And although I was entranced by the variety of the books in the museum’s library—some of them well known to me from references in the literature, others completely surprising (exhibition catalogs from Japan! )—I didn’t spend much time perusing them on that trip. Instead we spend almost the entire day in conversation with Margo, hearing about her fieldwork among women on the Finke River, her friendship with Howard Morphy, and her travels throughout Australia. If Southerners are famous for their hospitality, they are equally renowned for their storytelling, and Margo’s gifts are gentle and impressive on both accounts. Over the years since then we’ve returned to the Collection many, many times. We’ve made the acquaintance of most of our fellow American collectors there. We’ve sat down to dinner with anthropologists like Fred Myers, Francoise Dussart, Franca Tamisari and Kim Christen, not to mention Howard and Frances Morphy. (If you’re ever in a position to share a meal with anthropologists, be forewarned that they love to discuss other meals, usually consisting of exotic foods consumed in equally exotic locations: I suspect it’s a well-honed sub-genre of anthropological discourse.) Gallerists en route to or from the Kluge-Ruhe, Beverly Knight, Suzanne O’Connell, and Stéphane Jacob, among others, have detoured to visit us in North Carolina. 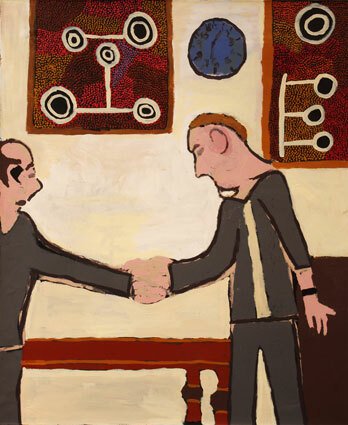 Margo introduced us to Ron Ramsey, recently of the Newcastle Regional Art Gallery, when he was the cultural affairs attaché in Washington, and to Brian Kennedy shortly after his arrival in the US from the National Gallery of Australia. I even had the chance to sit down once with the eponymous Mr. John Kluge himself (below), and his wife Tussi. Many of our first introductions to famous artists likewise came at Margo’s hands: Fiona Foley lectured, and presented us with an autographed copy of her monograph Solitaire. Rosella Namok, Fiona Omeenyo, Samantha Hobson, and Silas Hobson from Lockhart River shared their stories with us. We spend fascinating days with Terry Yumbulul from Elcho Island, learning the history of the Memorial that his father raised there in the 1950s, the subject of Ronald Berndt’s 1962 study, An Adjustment Movement in Arnhem Land. Juno Gemes came to visit with her husband, the brilliant Australian poet Robert Adamson. 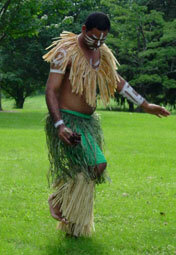 Alick Tipoti performed traditional Torres Strait Islander dances on the lawn out behind the museum on a cloudless June day. We met up once at Washington, DC’s Kennedy Center for the Performing Arts, where Margo introduced me to Stephen Page and members of the Bangarra dance troupe. In recent years, Margo has secured funding to bring artists over to the Kluge-Ruhe for residencies, and the town has turned out to meet Judy Watson, Reko Rennie, Vernon Ah Kee, Yhonnie Scarce, and Ricky Maynard. In just a few weeks, Tony Albert will be visiting to open an exhibition of his award-winning photographic series, Brothers. Margo has also organized traveling exhibitions from the collection since its inception, beginning with Dreaming in Color: Aboriginal Art from Balgo, which toured the world for the better part of a decade. Another early ambassadorial activity was the publication of Art from the Land: Dialogues with the Kluge-Ruhe Collection of Australian Aboriginal Art, which Margo co-edited with Howard Morphy in 1999. The list of contributors to that volume reads like a Who’s Who of Indigenous art scholarship: Luke Taylor, Howard Morphy, Djon Mundine, Wally Caruana, Christine Watson, Francoise Dussart, and Fred Myers. Margo has kept up a strong program of exhibitions at the Museum itself, too numerous to catalog here, although a few deserve special mention: Virtuosity, curated by Fred Myers, was a standout, as was the solo show drawn from the documentary work of photographer Juno Gemes. Regular lectures for the local community and the Friends of the Kluge-Ruhe always draw good crowds. And then there have been truly special events. In 2005 Margo brought to Thomas Jefferson’s famed Rotunda at the University of Virginia the symposium Media Matters: Representations of the Social in Aboriginal Australia at which scholars from around the world to discuss painting, photography, film, dance, and radio in an Indigenous Australian context. The panel discussion Sacred or Profane? The Australian Government’s Intervention in Aboriginal Communities that Margo sponsored in 2007 opened many American eyes to the abuses of the Howard government and the so-called Northern Territory Emergency Response.. 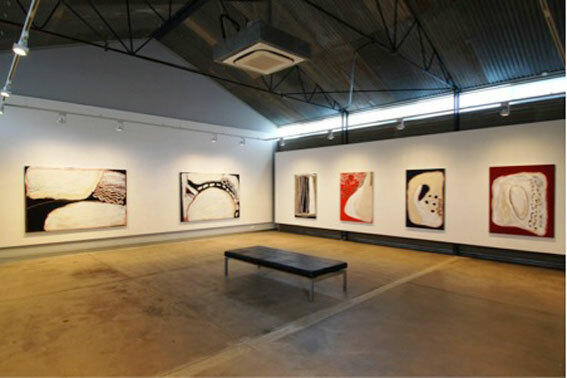 In 2006, Margo and Britta Konau, then a curator at Washington’s National Museum of Women in the Arts, organized Dreaming Their Way: Australian Aboriginal Women Painters, an exhibition of over seventy paintings by thirty-three artists drawn from public and private galleries and collections in the United States and Australia. 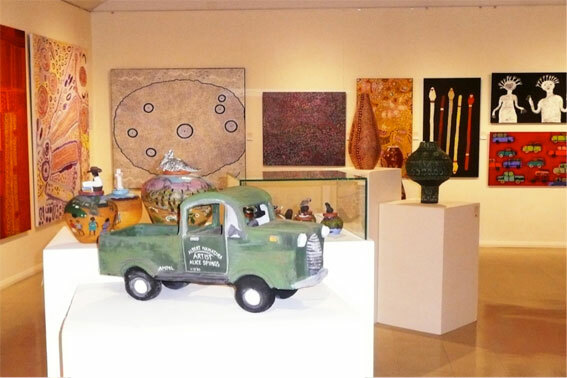 The show was an enormous success and traveled on to the Hood Museum at Dartmouth College after closing at NMWA. In May and June of 2007, I traveled with Margo through twenty-four Aboriginal communities in South Australia, the Northern Territory, and Western Australia on a tour organized by Austrade. Everywhere we went, coordinators and artists alike greeted Margo warmly. I marveled at the ease with which she struck up conversations at each stop, but one encounter stood out above all others. When we reached Bula Bula Arts in Ramingining, grand master Philip Gudthaykudthay was waiting to present Margo with a large canvas that she had earlier commissioned for the Kluge-Ruhe’s collection. Margo asked him to explain the design, and Philip, whose English was extremely limited, borrowed a pen from Margo and proceeded to make an impromptu sketch on a sheet of notebook paper as he spoke. When he finished, he rolled up the canvas and handed both the painting and the one-of-a-kind ink drawing to her. I hope these selected highlights of over a decade’s worth of visits with Margo—and there are many more stories I could tell, of dinners, symposia, exhibitions, and conversations—serve to demonstrate the depth of Margo’s commitment to Aboriginal art, her knowledge of its practitioners and their lives, and her genuine love of the culture. In twenty years of work at the Kluge-Ruhe and beyond, Margo has never put herself at center stage, but has rather allowed the art and the artists to shine and to speak for themselves. She has always striven to create an understanding of the vitality and the importance of this art. And so I write today not simply to congratulate Margo on this well-deserved honor, but to offer my personal thanks to her for enriching my understanding of Aboriginal art, for offering me countless opportunities to learn and appreciate, for good meals and good conversations and good advice. In truth, all of us who love this art are indebted to Margo Smith, AM. Readers who followed this blog for a long time know already of my admiration for John Carty’s work. John is an anthropologist trained at the Australian National University under Howard Morphy. He has long had an interest in art history, and has practiced both discipline throughout Western Australia for well over a decade now*. Patrick was sitting down in the art centre taking a break after completing a large painting by indulging in the creation of a few small canvases. John recalls the older man man working on a little pink painting when he was invited by the artist to sit down. Patrick proceeded to explain to John, in a mixture of Kukatja and English, the story he was painting, and how it was being represented on the canvas. Thus began a friendship that has ripened into the publication of a lovely new book, Patrick Tjungurrayi Beyond Borders (University of Western Australia Press, 2015), John’s biography of—and a bit of an homage to as well—Patrick Alatuti Tjungurrayi. When I first received an advance copy of the book, I did what I always do with a new art book: I flipped through the pages and looked at the pictures. The first thing to note is that Beyond Borders is visually stunning—and beyond. 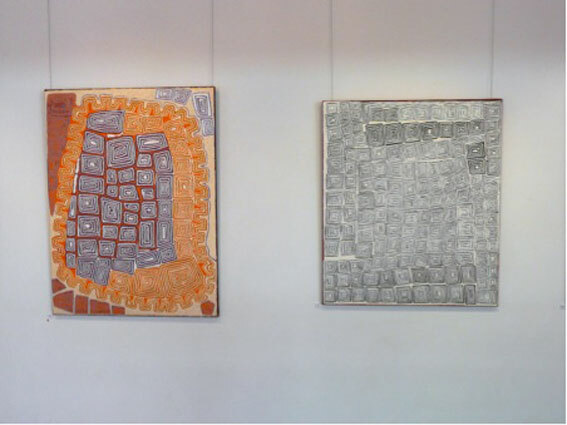 It is full of beautiful, high-resolution reproductions of paintings that span Patrick’s career from his first exhibited canvases in the 1986 Balgo exhibition, Art From the Great Sandy Desert, through his most recent work for Papunya Tula Artists. The first part of the book details Patrick’s early life out in the country that lies near the Canning Stock Route. 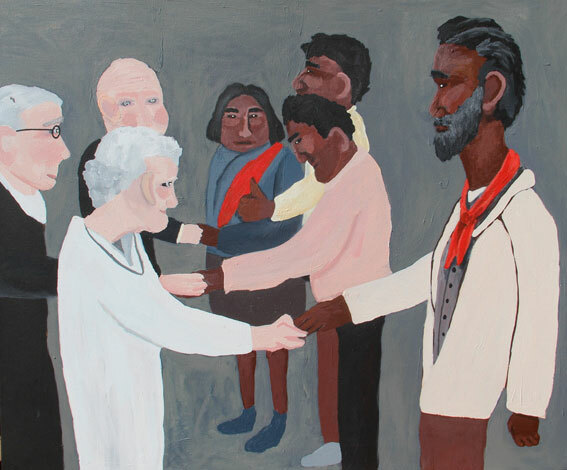 Illustrated with paintings that depict this country and with historical photographs from the 1950s and 60s as well as from the Canning Stock Route Project in 2007, this section summarizes the education and growth of the young man and his first encounters with whitefellas. Some of these stories are part of the familiar lore of the Balgo community, especially the medical rescue mission that gave Helicopter Tjungurrayi his long-lasting soubriquet. But there is more detail about those early encounters with helicopters (or dragonflies) that is sometimes amusing, sometimes wonder-inducing. John moves from this simply biographical perspective into the next phase of Patrick’s life, when he begins to paint. 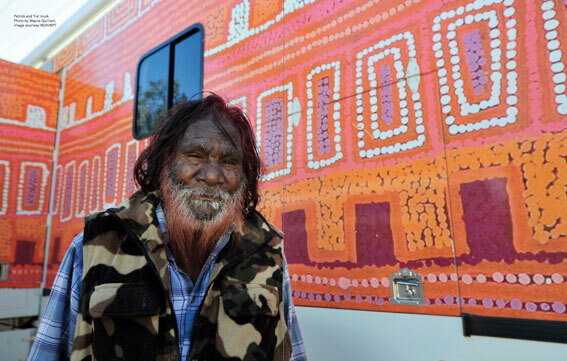 Patrick remembers being at Yayayi, near Papunya, in the early 70s when the painting movement was beginning; he himself made his first paintings at Balgo in the late 70s. Later, he moved to Kiwirrkura, closer to the country he came from. 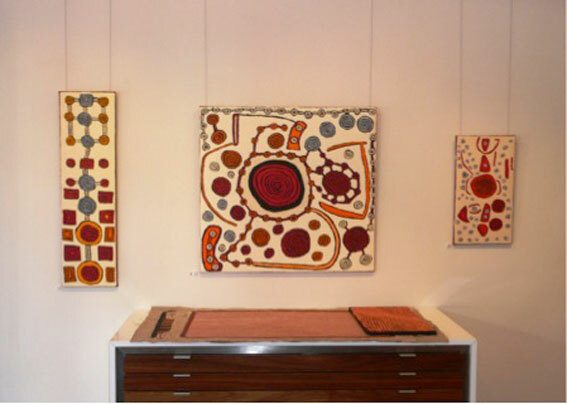 His travels between the two communities led to him becoming fluent in both the hot-color style of painting practiced at Balgo and the cerebral designs and muted colors of Papunya Tula. During the early years of the 21st century, following the Kiwirrkura floods, he traveled even more frequently between the two communities and emerged with a style all his own, grounded in his immense knowledge of the Law and of broad ranges of Country. Patrick Tjungurrayi Beyond Borders is a worthy addition to the library of anyone interested in Indigenous art, the history of Western Australia, medical and social issues affecting Indigenous people, and the anthropology of the Western Desert. That’s a lot to claim for a mere 125 pages, but thanks to John Carty’s insight and skill, it’s a claim well justified. It’s a consistently surprising and informative read, and a sheer visual delight, both as documentary and as fine art. The book is a profile of a great artist and Law man by a marvelous anthropologist and art historian. And John will be donating all proceeds from sales of the book to benefit the Purple House, as if you needed another reason to buy a copy. That’s a powerful combination all around. Don’t miss it. *John was a prime mover in the Canning Stock Route Project, which resulted in books that show off in some sections the art historical approach to an anthropology of desert art that John has undertaken: Yiwarra Kuju: The Canning Stock Route (National Museum of Australia, 2010), and Ngurra Kuju Walyja / One Country One People: stories from the Canning Stock Route (Palgrave Macmillan, 2012). 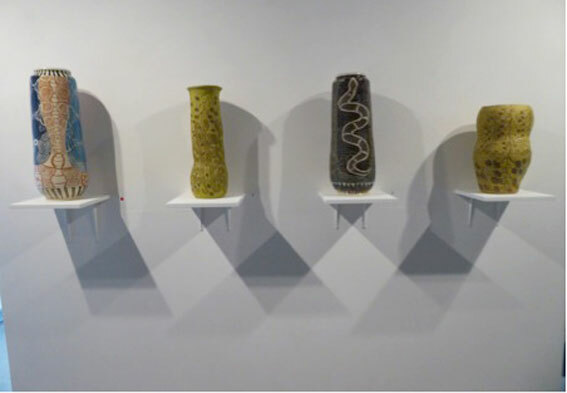 He was also deeply involved with the exhibition and publication Purnu, Tjanpi, Canvas: Art of the Ngaanyatjarra Lands (University of Western Australia Press, 2012). 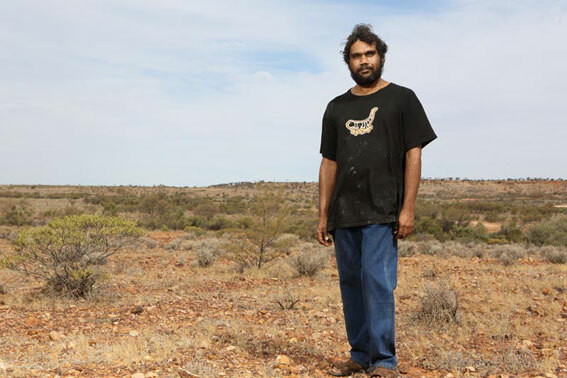 He was among the editors of Desert Lake: art, science, and stories from Paruku (CSIRO Publishing, 2013), has published a monograph on the Martu artist Billy Atkins (Martumili Artists, 2010), and has written about the Spinifex People in Spinifex: People of the Sun and Shadow (Curtin University John Curtin Gallery, 2012). I am especially pleased that he contributed an important essay, “Rethinking Western Desert Abstraction,” to Crossing Cultures: The Owen and Wagner Collection of Contemporary Australian Aboriginal Art at the Hood Museum of Art (University Press of New England, 2012). Will Stubbs is coordinator at the Buku-Larrnggay Mulka Centre in Yirrkala, NT, and a passionate advocate of Indigenous arts and Australia’s unique arts centres. A former criminal lawyer, Will in 1995 began working with Yolŋu elders and artists, such as Djambawa Marawili AM, Gawirrin Gumana AO and Wanyubi Marika. 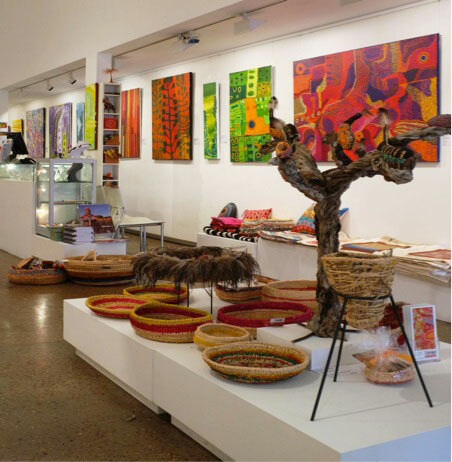 The Yirrkala artists have since won 30 major art prizes and exhibited widely and internationally, including Musee du Quai Branly. “A passionate advocate” in some senses hardly seems to capture the intensity of Will’s devotion to Yolngu art and culture; in another way, to call Will’s low-key approach to educating people, cajoling sponsors, and building programs “passionate” seems oddly off-key. Will burns with an intense but quiet light and he’s been one of the greatest of my mentors in coming to understand Indigenous culture. Those were probably the smartest words of advice anyone’s ever given me on this subject. I took them to heart and prospered. My hat’s off to you, Will. Again. A coupe of months ago, when I asked Glenn Manser to report on Desert Mob, he told me that he’d really like to write a piece for me on Vincent Namatjira. Last week, I received the article I’m posting below along with the images Glenn selected of recent works by the grandson of the great old man. The timing was impeccable, with the announcement this week that the British Museum has acquired a work by Vincent. That was followed by another announcement from Marshall Arts in Adelaide that their new solo show, Vincent’s first, has been purchased in toto by a state gallery to be named at a later date. 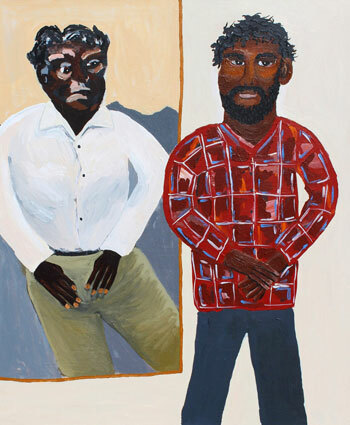 There is something distinctly familiar, in a fashion, about Vincent Namatjira’s backstory. His childhood was one of bewilderment and loneliness. What followed, however, has been entirely inspirational. At eighteen he returned to Hermannsburg to reclaim his heritage. Observing his Aunty, Eileen Namatjira as she worked at the Hermannsburg Potters studio, an impressionable Namatjira subconsciously absorbed the inspiration of his ancestors. After four years of work and study completing a land management course in Darwin, a starry eyed Vincent met his wife to be, Natasha through friends at the Kanpi community. It was under the tutelage of Jimmy Pompey, Natasha’s father that Vincent began to explore the medium of painting. More importantly his dormant desire to explore his own creative abilities emerged. 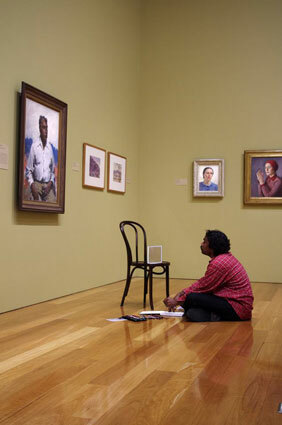 In May, 2014 he visited the Queensland Art Gallery/Gallery of Modern Art to observe the watercolours of his grandfather. More profoundly it was Sir William Dargie’s 1956 Archibald Prize winning portrait of Albert Namatjira that impacted him the most. The pride was obvious. Eclectic though his subject matter is, Namatjira intuitively explores the historical and contemporary with equal sincerity and, where appropriate, wit. 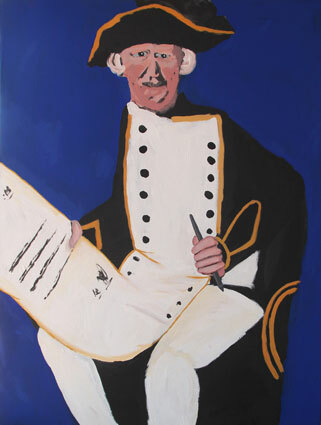 His portrait of Captain Cook with Declaration, acquired by the British Museum in 2014, represents the explorer empathetically as if there is no blame to stain his reputation. Amusingly, Tony Abbott’s 2013 election success is captured in a hand shake between Abbott and his mentor, John Howard. The time 6.05pm and even then victory was assured. 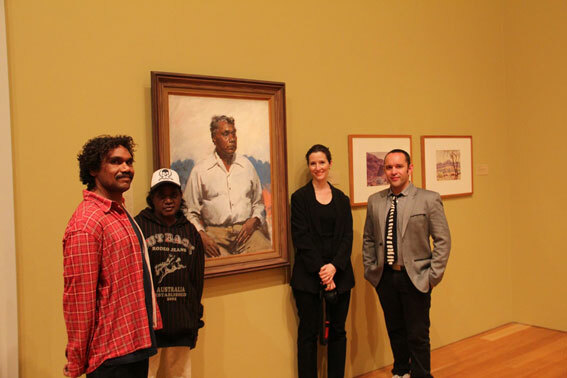 The two dot paintings in the background symbolise Namatjira and his wife, Natasha, observing this moment in history from a distance. He has, therefore, inserted himself into this historic scene, and it serves as a powerful reminder that the people in the bush are watching proceedings in Canberra. There is much more that could be said about this young man who proudly bears his forebear’s name. 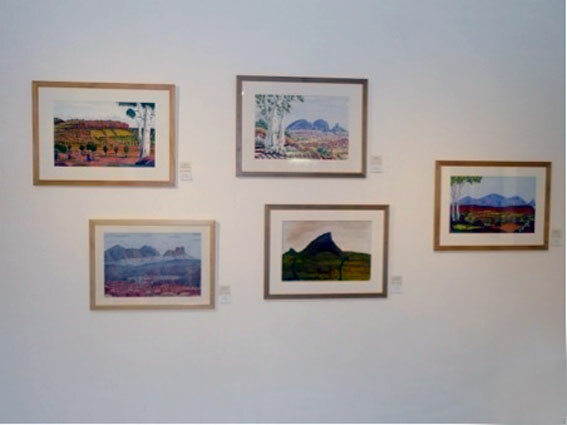 Suffice it to say that like his cousins, Lenie and Kevin who continue to paint masterful watercolours for the Ngurratjuta Art Centre in Alice Springs, Vincent is determined to chart his own course as an artist yet in doing so remain true to the spirit of his famous grandfather. No doubt Albert Snr would be proud to embrace the success of yet another Namatjira.